Google's new Project Fi cellular carrier has been making waves across the mobile industry, so we decided to put it to the test against T-Mobile, one of the more established networks. For the actual testing, we slapped a SIM card from each carrier into two identical Pixel XL phones, which offer full compatibility with both networks. 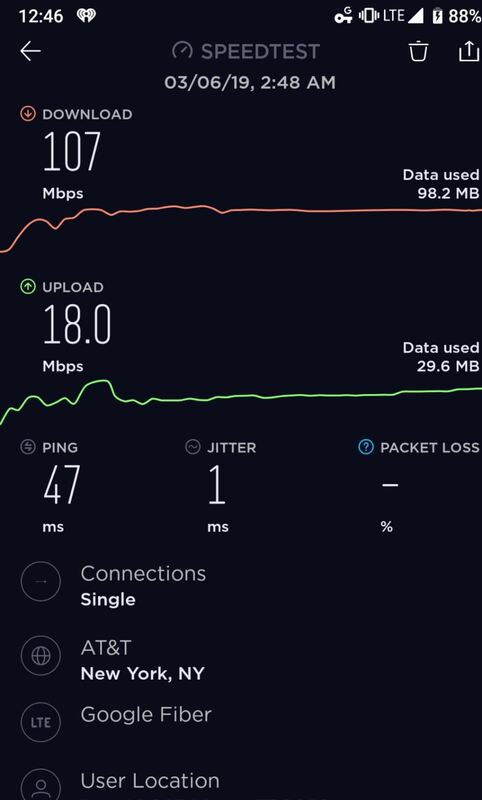 From there, we used an app called Signal Spy to check network connections and signal strength, then we used Ookla's Speedtest.net app to see how fast the internet connection was on both networks. After that, we hit up various spots around Southern California to see how each network performed when tested side by side. Full disclosure, I'm a long-time T-Mobile user who is currently considering making the switch to Project Fi, so I have a vested interest in these test results. Nonetheless, I tried to keep things as unbiased as possible. I tested both networks within minutes of each other, working as fast as I could to take screenshots on both phones. Then, I simply overlaid the Signal Spy results on the bottom of the Speedtest.net screenshots to make the information easier to digest. 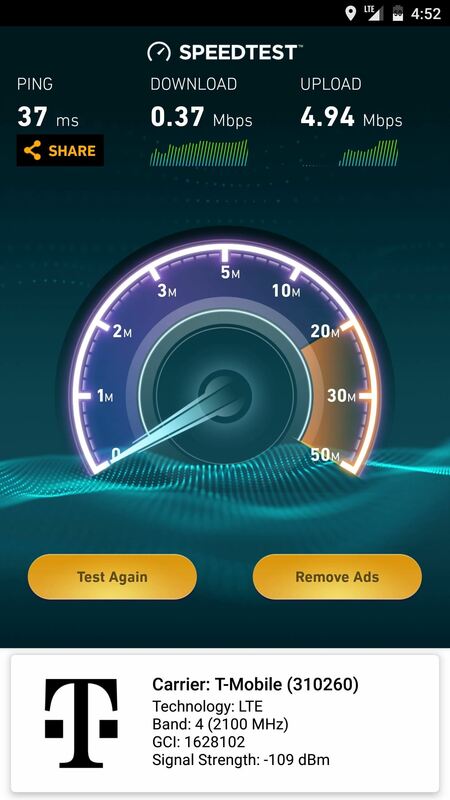 The testing locations were selected at random, with the exception of Test #4, which was chosen because it was an area with poor cell reception for both T-Mobile and Sprint. Project Fi uses a combination of Sprint, T-Mobile, and US Cellular towers to fill out its coverage map. Aside from that, the only other factor worth noting is that US Cellular, Project Fi's third network provider, does not offer service in Southern California. So if you live in an area with US Cellular coverage, your results may be different than ours. Here we see exactly what I was hoping for as a T-Mobile customer who wants to switch to Project Fi. In a location with absolutely terrible T-Mobile service, the Project Fi Pixel XL connected to a Sprint tower instead, and got much better internet speeds. (1) Project Fi. (2) T-Mobile. Note that signal strength was only slightly better for the Sprint cell tower, even though the internet speeds were miles apart. This could point to network congestion being an issue with T-Mobile, though I tested at this location multiple times over the course of several hours and got the same results. The second test was perhaps the most interesting one, as it shows one downside to Project Fi. Google's carrier is supposed to automatically switch to the strongest available network, be it T-Mobile, Sprint, or US Cellular. But that didn't happen here, as the Project Fi Pixel XL stayed connected to Sprint, whose -95 dBM signal strength was lower than the -64 dBm T-Mobile tower serving the same area. As a result, the T-Mobile Pixel XL absolutely dominated in the speed test, achieving 81.89 Mbps download speeds compared to only 30.21 on Project Fi. Had the Project Fi phone switched to the better T-Mobile tower like it was supposed to, it would've had more than double the download speed. The third test demonstrated how similar Project Fi and T-Mobile can be in certain areas. Many times, T-Mobile has the best signal quality in a location, so a Project Fi phone will essentially get the same reception and speed test results as a T-Mobile phone. One noteworthy aspect here is that the Project Fi Pixel XL successfully connected to T-Mobile's Band 4 frequency. This is the frequency T-Mobile uses for most of its LTE coverage, so it's good to see that Project Fi is not limited to older frequencies when connected to T-Mobile towers. Finally, I tested the two networks in a location that has poor service regardless of which carrier you use. The test was performed deep in a canyon, almost out of reach of nearby cell towers. In this example, the Project Fi Pixel XL did what it was supposed to do by connecting to Sprint's network, which had slightly higher signal strength than T-Mobile. Ultimately, Project Fi outperformed T-Mobile in terms of download speeds, but uploads were faster on the magenta carrier. Google's auto-switching technology seems to focus on signal strength first (for the most part), so upload speeds don't appear to be a factor when the device decides to connect to a certain tower. For the most part, Project Fi seems to be a better option than T-Mobile when it comes to reception and internet speeds, at least in Southern California. But we expected this to be the case, as Project Fi uses three networks compared to T-Mobile's one, and T-Mobile itself is one of those three. But the main thing we learned here is that Project Fi doesn't always beat or match T-Mobile, even though it has the advantage of switching from those same T-Mobile towers to Sprint or US Cellular if the reception is better. This is because Project Fi's automatic network-switching feature is not always perfect, so occasionally, you may not be connected to the cell tower with the strongest signal. Truth be told, my experience with Project Fi has been overwhelmingly positive so far. For my personal usage, Project Fi offers better signal quality at a cheaper price than T-Mobile, so after 14 years with big magenta, I'll finally be making the switch to Project Fi this month. I usually get the results you guys posted. Somewhere between like 6 and 25 Mbps but the other night I clocked in at 107/18. Is it possible?